New World Library, 9781577315513, 517pp. With evocative language and personal stories, including those of elders Thomas Berry and Joanna Macy, this book defines eight stages of human life - Innocent, Explorer, Thespian, Wanderer, Soul Apprentice, Artisan, Master, and Sage - and describes the challenges and benefits of each. 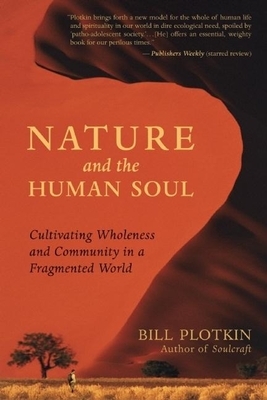 Plotkin offers a way of progressing from our current egocentric, aggressively competitive, consumer society to an ecocentric, soul-based one that is sustainable, cooperative, and compassionate. At once a primer on human development and a manifesto for change, Nature and the Human Soul fashions a template for a more mature, fulfilling, and purposeful life - and a better world. Bill Plotkin, PhD, founder of Animas Valley Institute, describes himself as a "psychologist gone wild." A cultural visionary, author, and guide to the entwined mysteries of wilderness and psyche, he's been blazing new trails for decades. His ecocentric re-visioning of psychology invites us into a conscious and embodied relationship with soul and with the more-than-human world. His other books are Soulcraft and Wild Mind. He lives in southwestern Colorado.